If you still had any doubt that Apple is developing its first smart watch, this news will clear. 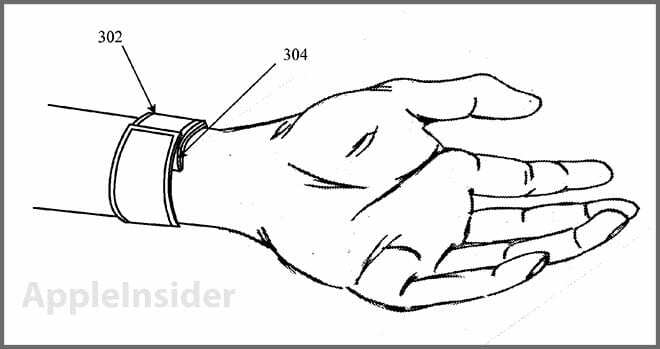 The Trademark Office U.S. Patent and collected, in August 2011, a patent for the company on the block in which, basically, we can see a kind of iWatch, which could be, in part, on the clock the company is now working with a team of more than one hundred employees . The paper describes "an accessory to dress that has a flexible screen that can be placed around the user's wrist." While the flexible display technology seems far from achieving perfection, we can not fail to mention that this is the first document relating to the possible Apple iWatch set out in the Patent Office of the United States. Once the bracelet on the wrist of the user, the screen would detect its position to display information such as time, date and time, all helped a gyroscope and an accelerometer. This display, located on the bracelet, would be able to perform simple tasks and connect with our iPhones. We must also mention that the screen embedded in the bracelet would touch. Will we see something similar this year? Article An Apple patent shows the possible iWatch was originally posted in News iPhone .